We received this product for review services. As always, all opinions are honest and my own. Every Easter I hope to be a Pinterest mom. I want to spend a full dau crafting perfect Easter eggs in a variety of colors and patterns. Almost every year the day after Easter, I head to the stores to pick up the egg dyes as soon as they hit the clearance rack. Those things don’t expire, do they? The the next Easter comes around and I forget where I’ve stored the clearance dyes, stickers, paint sets and go buy them all over again. This can’t be just me, can it? Now, one would think that since I go through all of this and spend all of this money that we have the best time coloring Easter eggs. Honestly, we have had fun with them but in all actuality, I think it’s too much work for too little return. I think that’s why sometimes I “forget” to do them with JustaBXgirl. I mean the set-up time alone is enough to make me not want to go through with the project. And then trying to find a way to dry the eggs without messing up the design, don’t get me started on that catastrophe. We always end up with that mark on the bottom of our eggs from sitting them in the dry tray. All this leads me to how EGG-cited I was when I learned about the Eggmazing Easter Egg Decorator at Toy Fair this year. You might remember seeing the Dino version in my recap. I really thought it was a cool idea. And it seemed so much easier than what we have been doing that I couldn’t pass up the opportunity to try it out at home with JustaBXgirl. The Eggmazing comes with eight color markers so it gives you a lot of options to design with and we know my little artist went right to work using ALL of the colors. I ordered some fake eggs from Amazon because I recently saw this sign on a bus stop that said it takes 53 gallons of water to produce ONE egg!!! Anyway, I figured the fake eggs would be better because then we can keep them and use them in JustaBXgirl’s Disney Kitchen. We have decided that the decorated eggs could be special meals she serves at her diner! 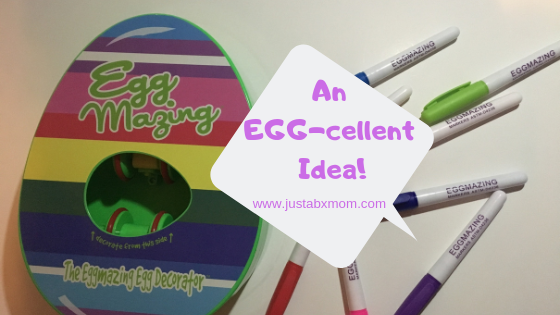 It is so easy to use the eggmazing egg decorator that I was able to let JustaBXgirl figure it out on her own. And then she was excited to tell her older cousin how to do it before giving him the chance to figure it out! It was a fun family bonding time and now I know that they can be trusted to do it themselves. And they have. I’m happy that I ordered 50 eggs or we probably would have been out already. I see us using this after Easter. It is a great addition to our arts & crafts shelf. JustaBXgirl is already planning on all the ways she will be able to use it to create gifts for her aunties. We will be out of town for Easter which is one of the reasons we have started our Easter fun early. I’m trying to find time to schedule an egg hunt. We went to one last year that had specialized eggs for each little in the hunt. I want to use the decorator to create color designs for each little in the hunt. I want to get wooden eggs for them so that they can also be kept after. And guess what? I want you and your family to have the chance to experience the fun so I will be giving away one to one of my readers!!! All you have to do is leave a comment here letting us know your Easter plans and then go follow me, JustaBXgirl, JustaNOLAmom, and JustaNJmom on Instagram. I will be choosing a winner on Monday, April 14th. To start, soak hardboiled eggs in liquids of choice. I let them soak for several hours. The eggs will be stained a color, representing teeth before they are brushed.